[StormChasing] #FriendlyFriday Features Storm Chasing Master Chris Kridler! Over on Patreon, Sarah and I run a feature every week called #FriendlyFriday, where we tell you all about my fabulous friends and what brilliant things that they are up to! 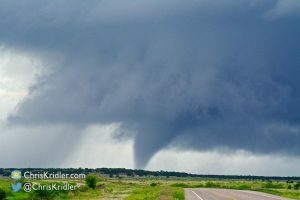 Since I am gearing up for my Storm Chaser Apprenticeship, I thought I should take a moment to tell you a little bit about the woman who helped inspire it: Chris Kridler! 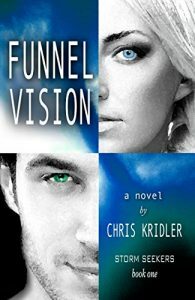 Chris is the author of the novels Funnel Vision, Tornado Pinball, and Zap Bang. Each Spring she heads for the middle of the US–Tornado Alley–to record and photograph some of the deadliest storms in our country. And this year I am riding shotgun! Besides taking some breathtaking photos of these storms, Chris records all the data that comes along with them. From precipitation to temperatures, the recorded information is used by scientists and storm chasers to help track down Plains supercells and tornadoes, Florida storms and tropical weather (hurricanes). She has been on hand for some of the worst storms in the last 20 years, including the EF3 (initially reported EF5) tornado at El Reno, Oklahoma in 2013, which was the widest ever recorded at 2.6 miles and took the lives of three well-respected storm chasers and at least 17 others. She will be the first person to tell you how dangerous storm chasing can be, but also how necessary it is for us to record and understand them. “I would hate to see an end to storm chasing. Even though it’s a hobby for me, as well as a professional interest in terms of photography, it’s also been important to weather reporting, research and warnings over the decades. I’m not going to pretend that all storm chasers are virtuous life savers, because most of them aren’t. But most are good people who are happy to share what they know and respect the weather and others – who, like me, enjoy the beauty of the Plains, the challenge of forecasting, and the pleasures of traveling through middle America with friends. I fell in love with chasing when I took a storm tour in 1997. Since then, I’ve chased with friends or on my own all over Tornado Alley and beyond. I’ve given presentations about it. I’ve satirized it in novels. I’ve taken photographs I couldn’t get any other way. And I wouldn’t trade a minute of it, except for the moment when I learned that Tim Samaras and his crew were killed. I’ve ordered my special Storm Chaser tiara (more on that later!) and my #OzorBust t-shirt, I’m almost ready to hit the road with Chris! I hope you’ll follow along at home as we head out on our adventure this May. I can’t wait to see what the sky holds in store for us! So…guess what I’m doing this summer? Why, I’ll be gone with the wind, my darlings. More specifically…I AM OFF TO BE AN APPRENTICE STORM CHASER. Storms have fascinated me ever since we studied the different cloud forms in elementary Earth Science. They were a sizable element of my studies when I was on track to be a Marine Chemist, back in college. Twister was fascinating to me…mostly on an incredibly geeky scientific level. So when my friend—author, photographer, and Master Storm Chaser Chris Kridler made an offhand remark last year about how I “should go chasing with her sometime,” I made sure she didn’t forget it. She said, if I was serious, I should block out the entire month of May. I’m pretty sure she didn’t think I was serious. But I want to be clear—I am not a risk taker. I am doing this for the science, and the experience. “Amateur Storm Chasers” are those yahoos that hear about a weather report and hop in the car armed with their phone and ZERO scientific equipment. I had a boyfriend convince me to take a ride like that once. ONCE. Driving blind into threatening cloud formations scared me half to death. Because IT IS A STUPID THING TO DO. 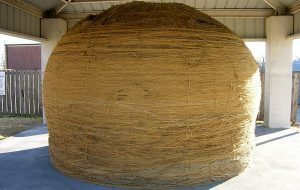 DO NOT DO THIS THING. I knew that if I ever went Storm Chasing again, I would do it right. So here we are, on the cusp of May, and I am officially your Storm Chaser Princess of 2018, reporting for duty! In the weeks to come, I’ll be posting all about my prep for storm chasing: everything from packing (t-shirts are so important!) to playlists and cameras and Trip Goals, to test runs, info about Chris, and advice she imparts to me as we gear up for the road. I’ve been saving up money to cover food, gas, and hotels—if you’d like to throw a few bucks my way to help with any of this (or the occasional Starbucks), you can PayPal akontis at gmail or click the Donate button on the right. If you’d like an All Access Pass to my daily Storm Chasing Diary and all my photos, go over to Patreon and become an official Patron of the Princess! Even a pledge of just $1 a month will grant you access! As each day passes, I’m getting more and more excited. I’m looking forward to riding Shotgun with the Master…and having my Patrons right there with me in the front seat! Chris says that Storm Chasing usually begins around second week in May, but she’ll be watching the skies. As soon as everything feels right, I get the call and we hit the road! OMG I AM SO EXCITED YOU GUYS. Seriously. I want to start packing, like, now. And at this point in my career, I pretty much hate packing. But I have to be ready to go. 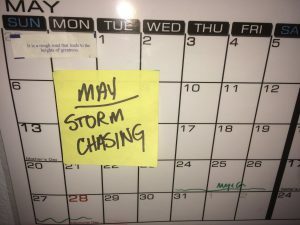 Because in May…THE CHASE IS ON! 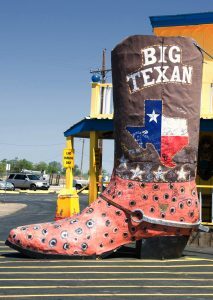 No Comments | Tags: oz or bust, ozma, patron, storm chaser, weather princess, what i did this summer, WOOHOO!